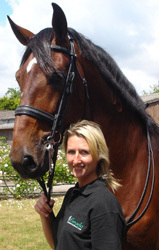 Emvelo Products Ltd announced that they are delighted to be supporting Dressage Rider Amy Stovold for the coming season. Amy Stovold is one of the country’s leading dressage riders Amy has is part of the World Class (2009-2011) Development Programme aiming at Olympic medals and top international competition. She has four top competition rides, a wide client base and is in constant demand for training. Amy recently moved to a brand new yard in West Sussex, before the horses even arrived Emvelo Stable+ was sprayed prior to the bedding going down and afterwards. Using Emvelo Stable+ is now part of Team Stovold’s weekly routine. Emvelo Stable+ incorporated into good stable management practise may also assist with the horse owner’s budgeting. Keeping odours to a minimum can make bedding last longer. Also using Emvelo Stable+ has shown good results on ‘composting’ the muck heap quicker, thus keeping the costs of removal lower in the knowledge that you are putting goodness back into the environment. Emvelo makes natural animal care products which are carefully selected to provide a better environment for your animals. They focus on reducing odour, providing microbial balance and reduce challenges from insects, disease and infection.